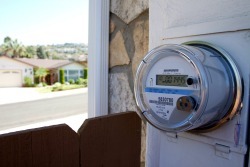 Smart meters, a common form of smart grid technology, are digital meters that replace the old analog meters used in homes to record electrical usage. 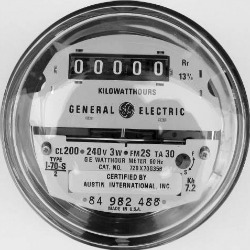 Digital meters can transmit energy consumption information back to the utility on a much more frequent schedule than analog meters, which require a meter reader to transmit information. Electric energy use will be recorded every hour or less at your home. Smart meters will enable you to monitor your consumption more precisely so you can make more informed energy choices. Depending on the feature set, the meter may also notify the utility of a power outage or allow the utility to remotely switch electricity service on or off. Learn more from the U.S. Department of Energy. If your electricity meter has been replaced since January 2009 with a digital meter, it is likely a smart meter. 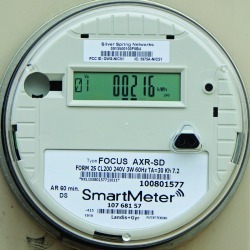 Smart meters have a white face, with an LCD display, short for liquid crystal display, which is similar to the display used in digital watches and many portable computers and televisions. If you still have a meter reader visiting your house to take regular readings then you don’t yet have a smart meter. Another way is to check is that sometimes, depending on your utility, your monthly utility bill will have a statement in the "Notes" section indicating that your home is equipped with a smart meter. ﻿W﻿ho has the control over my energy consumption with smart meters? Advanced metering gives you more control. Participating in residential energy management and other energy efficiency programs is completely optional. Customers who participate can use the information they receive to manage their energy usage day by day. Or, they can set preferences and let the system automatically make adjustments based on the cost or availability of energy. Either way, the customer is in complete control and will have the option to override signals or not participate in energy-efficiency programs at all. Learn more here. With everything happening with the “cloud,” how can I be sure my stored data and information are safe? When data is collected from a meter and transmitted wirelessly to the utility, the data contains specific unique identifiers associated with the customers meter number and service address. More information here. Security is a top priority for utilities. Utilities have extensive experience maintaining security on the information systems needed to operate the electrical grid. See some examples. Some people have expressed concerns about the possibility of negative health effects from the radio frequency (RF) waves that smart meters use to communicate. Learn the truth here. ﻿You’ll agree that there are many reasons why the new plan to modernize the electricity grid deserves to be called smart. See benefits here.